FILE PHOTO: Captain Imran Khan and President David Granger. Bad weather, South America’s thick tropical jungle and rugged terrain on Monday conspired to delay the flying of the body of Captain Imran Khan to the coast one day after he perished in a plane crash, sources said. Members of the Special Forces of the Guyana Defence Force (GDF) spent all day fetching the body along high and steep mountain sides and through dense forest. Sources said that the chances of reaching the pick-up site located at an old gold mine before night-fall are slim because of a bad rainstorm. Thunder, lightning, rain and poor visibility have forced helicopter and plane pilots to suspend operations for the day. Helicopters from the Guyana Defence Force and Air Services Limited earlier Monday air-dropped food and water for the soldiers who left the crash site several hours ago with the body. The sources said the soldiers and other personnel are expected to arrive at the pick-up point late Monday evening. Khan’s body would be further prepared for it to be flown to the City early Tuesday morning. Guyana’s light helicopters cannot be used to rappel persons over the jungle. Sources said ExxonMobil withdrew its offer to provide helicopter support because the pilots have not been trained to conduct such operations over jungle. 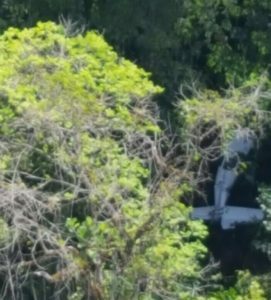 The Cessna 206 plane, bearing registration markings 8R-GFM, crashed shortly before 9 O’clock Sunday morning while travelling from Chai-Chai to Mahdia. Khan’s body was found on the ground while the plane hung on the tall sturdy trees. The plane went down about two or three miles from Mahdia. Sources believed that Khan might have been flying lower than 3,500 feet in hazy conditions and one of the wings might have clipped a mountain face. He is the second pilot to have perished in an aircraft in just over one month. 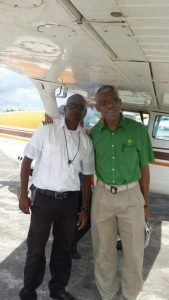 Roraima Airways’ Chief Pilot, Collin Martin died in July when the Britten-Norman Islander crashed at Eteringbang. Two weeks later in August, a Wings Aviation pilot, Dominique Waddell sustained injuries when the Cessna he was flying crashed at Eteringbang. The Guyana government has called on the GCAA to conduct frequent random inspections of planes and pilots to ensure they are sticking to the rules.